Stereo was started in 1973 and is the oldest German hi-fi magazine on the market. Stereo has always focused on the pure audiophile perspective of listening to music, even when surround-sound and home cinema appeared. 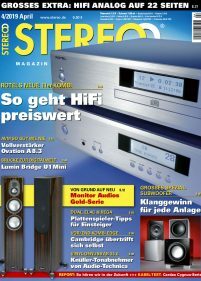 Today, Stereo is one of the three big hi-fi magazines in the German market. Stereo offers tests and other information such as, news, interviews and CD reviews. Although most of its work is devoted to high-end products, it also includes MP3-players and mini systems. Stereo is aimed at the true audiophile music lover who wants more than just superficial information, and so it publishes listening results and detailed measurements. Its readers are interested in new media and technology but are also interested in traditional audio products like turntables.